We are jumping for joy here in Spain! Yep, that's Mozart at our local playground in our 15th century village. Thanks to our friend Peace Mitchell in Australia, we found out this morning that we have been nominated for three, yes THREE different Lonely Planet travel blogging awards! I am hacking away with my first cold of the year, feeling like I am in a fog and this wonderful news woke me right up! What a difference a day makes, eh? I am stunned. I think we are the only ones who got three nominations, although a couple of our friends got two nominations. When I first looked, I thought we did not get any, as we are far down on the page. I have been discouraged by these voting contests in the blogosphere because it often seems based on how many votes you can get from friends. Recently we were one of the top travel nominees in the Shortyawards , but I did not even blog about it. I was very disappointed in the cheating and buying votes that was reported on the wildly popular Techcrunch and Pistachio .Nevertheless, the press had a hey day with it , including our local home paper the Mercury News! I didn't even tell family or friends about this Lonely Planet contest, even though I have great respect for Lonely Planet guides and we would really like to win it. I am busy just trying to catch up here in Spain , so I never dreamed we would be nominated for one, let alone three categories. I was shocked when I read Lonely Planet's Mathew Cashmore say on Twitter that " I haven't counted the number of blogs entered yet but it's well over 500. The top nominated blogs all got over 100 nominations". All I can say is, thank you, thank you, thank you to the people who nominated us. I am honored to be amongst some amazing blogs like National Geographics Intelligent Travel, Elliottdotorg and TravelRants plus many other friends, too numerous to mention. The nominations were done strictly by votes, but Mathew Cashmore also said " nominations however was based totally on public nominations - no judges - I think we may change that next year it was a mistake I believe." I think I have to agree with him and my friend Nomadic Matt who said on Twitter "i havent heard of half of the travel blogs nominated for the LP awards". It is true, I have not heard of half of them either and this is typical of award contests in the blogosphere, because this voting thing can be gamed and fixed. Even if someone has a bad blog they can win if it is based on votes. Some great ones get through, but there were also some great ones missed. Perhaps that is just the way of life. I am not sure if there is any way to do a contest and make it really fair. I think a lot of bloggers feel frustrated by these things. That is why I was completely shocked. I had written these off as I just did not want to play the game of asking for nominations only to be disappointed again in a rigged contest. There were many really wonderful travel blogs that were left completely out. It is always the case. That makes me sad and I hope they do change the rules next year because Lonely Planet is a prestigious name that any travel blogger would like to be associated with. The good news is that the voting now only counts for 50% and judges count for 50%, so I am hoping against hope that we get a fair shot. By some how miraculously getting 3 nominations, maybe we will actually get to win this one! I feel as excited as if I just got three oscar nominations. Actually 3 different things we do are nominated. * First is for Best Microblogging that I do on Twitter ( we now have over 5000 really cool followers there). We work hard to bring the joys of our travels to you and give you the information we are learning along the way, so it is really rewarding to be acknowledged. I am thrilled to be nominated, tickeled pink that we some how got three nominations, so would really love your votes! It is an easy one to do and you can see the results as they go which makes it exciting ( or maddening). Just click on that link that says vote here and it will open the page on Lonely Planet, scroll down until you see Best Microblogging, Best Video Blog and Best Themed Blog. Luckily, the three we are in are all together. You just click on Soultravelers3, which fills the little circle next to our name, then just below the nominees in each category you will see a vote button. You click on that. Do it once for each of our categories and you are done! Look at the other categories too as there are probably many other blogs that you would like to vote for. Thank you so much for nominating us and thank you so much for voting for us! I am overwhelmed with gratitude! I have heard so many congrats from people on Twitter and Facebook and appreciate them all. I also came across this wonderful post by Carrie Marshall, a Canadian who has a great blog called My Several Worlds about her travels over the last six years. How sweet! Tell all your friends, because this is going to be a tight one. It closes at midnight on March 20 which is fitting as that is just a few days after my birthday! Hopefully, it will be a fun birthday surprise for the absolutely oldest person in the whole contest! Grin! At least we will always have bragging rights on three nominations! Life is beautiful! Congrats on being nominated! I voted for you. :) I enjoyed this post. I was fortunate to have the info about Divine Caroline passed around my entire college campus thanks to former professors and the college newspaper (which I didn't even know about until I was given the paper and saw an amazing article written about me), but it is discouraging when people can "cheat" their way to winning. It's so awesome you are nominated for 3 categories for LP! I am rooting for you. After talking to the LP people, I am truly dissapointed in this awards. I mean if you win, even if it is gamed, it is the best PR for a blogger possible. It will do wonders for you. However, have you looked at the podcast votes, one person as like 400 already. a little fishy. The problem with these awards, like the webbies, is that most popular web user wins not best blog or best content. Vagabondish is the biggest weblog by traffic out there but no nomination? travel blissful? happy hotelier? world hum? odd these got missed. I love your videos but I don't think a youtube page really constitutes a video blog. Amtrekker is a video blog. Gary's photo page is just his photo page, it's not really a photo blog. lifeofjustin or asian ramblings or geotraveler are photo blogs. I think these awards could have been huge but after looking at it all, I feel like it's the webbies all over again. Like you, I give little credence to competitions that are based 100% on the public vote and, like you, I think winning a travel blog awards run by Lonely Planet would be an amazing boost and validation for all the hard work we're doing. It's great that this competition is 50% public vote and 50% judges' decision. That gives it some kind of ratification in my eyes. It's what makes me excited. That said, Notes in Spanish is a language learning podcast rather than a travel one and Notes from Spain has only released one show this year (although the blog remains active). I love the work that Ben and Marina do, but I think it's suspicious that in "best expat blog" NFS has 996 votes when most categories have around 200 votes total. In "best podcast", NFS and NIS have a combined total of 1169 votes. This is after around 24 hours of the competition being launched; it's not advertised on any of the blogs; it's not on the LP homepage yet. Strange, huh? At any rate, the "human" side of the judging should examine quality and consistency. Linda and I would not be ashamed to lose to such strong competitors on that side of things. Of course, we'd love a win as much as anyone. We're advertising the competition on our homepage, sidebar, mailing lists, facebook and I have the feeling our twitter stream is going to get a little repetitive over the next three weeks too :) Good luck, everyone. Three nominations! Congratulations! I just put my votes in for you. Congratulations on the 3 nominations. Also, congrats to all the other nominees. Lots of great blogs on the list. There is always controversy with awards that are selected by viewers or readers. It is what it is. 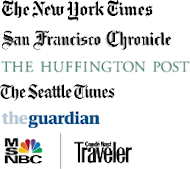 Bottomline is that it's great exposure for the bloggers who were nominated and it's good for travel, in general. It is pretty exciting to be nominated, although it is very disappointing to see many blogs who I thought should have made it didn't. Hopefully next year this will be a little different. As Matt said, I think the 50/50 rule will fix much of that imbalance. I would have loved to see Almost Fearless and a few other really well written blogs on the list. Congrats to you guys, and I think the only reason I'm winning my category is because I'm the first on the list! Otherwise I wouldn't have a chance! 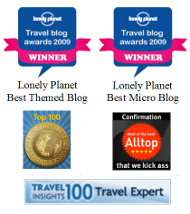 I can think of half a dozen destination blogs that deserved the nomination more than I did. Still, it's pretty awesome as we've never bothered with a contest before. Just an update on the points issue, LP labs (I keep typing laps...nothing to do with dancing, people!) has come out with a description of the system. Some votes have also been removed across the categories. Matt, I would agree that the categories could have been better policed and it seems LP are going to be adding a human factor into nominations next year. Remember this is their first year and it's running under the "labs" banner. I would love to see this being a successful move on LP's part and it become more mainstreamed in the future. Let's all try and give it our support. Like Genarro said, it is what it is -- and great exposure for the nominees, winners and the travel blogging niche as a whole. Hi everyone - I just wanted to take a moment to try and set your minds at rest about the voting. Combine that with the constant monitoring of the logs and active removal of fraudulent votes and I hope that we end up with something which is as fair as it can be. I do take on board that the nominations were a total popularity contest - it was a numbers game and some people played that game very well - next year we'll use the same system for the voting and nominations. Once the awards are over I'll publish the full list of blogs nominated in this years awards. As far as the number of votes goes... you'd be surprised how many hits lplabs.com gets - not to mention my twitter stream, the lplabs stream, the other lp streams, my facebook stream and so on - it's not surprised me in the least that we've seen a shed load of votes in a very short period of time. Yes, I thought the *nominations* were going to be 50% pop votes / 50% professional judging. Which would have eliminated ballot stuffing. Having the top five of popular nominations just makes it a popularity contest and really doesn't have any cachet. If you want it to be a real awards program study how some of the oldtimers do it, like the Webby Awards for example. Everyone submits their blogs, professionals in the field judge the sites, then there is public voting. The awards are given by the judges and the People's Choice awards are given by public voting. Sites are not only given awards based on content, but also on site design and usability. Congrats guys! It's inspiring to see people in your situation ("older" with youngins) traveling. I think your blog definitely deserves to be there - but like Matt I'm an avid blog reader but hadn't heard of two thirds of the nominees. Having said that there may be some great blogs out there that have passed me by so I'll be taking a little time to check them out before I decide who to vote for. We're taking all of this on-board as we run them for the first year and we'll solve some of these things. It is interesting (I ran quite afew comps like this whilst I was at the beeb) that every community has different ideas of what us fair. I think our voting system is the mist robust put there, but I know our nomination system lacks fairness. Thanks for helping us find this issues in the first year do we can fix them fir next time. Thank you so much for coming by Matthew, it's great to hear the Lonely Planet perspective. We really appreciate what you are doing and love how you are addressing eveyone's concerns here and on Twitter. I think we all see what a fantastic opportunity this is for everyone in the travel community. Matt, I am sorry about your pain and I understand some of your feelings. I do disagree that we should not have been nominated for three or that some should not be have been nominated twice. I do understand it though and how that must feel to people who did not get any nominations. I think we deserve all three and they are really three different blogs that we were nominated for. Best Microblogging is our Twitter account that is very separate than this blog. I write everything on this site and the Twitter account, but they are very skills. We were also voted for Best Video Blog & I think we clearly fit under that category and have the most popular and artistic travel videos in the contest. We have had over 1.2 million views on our Soultravelers3 Youtube Channel! One of the others in this category is also on Youtube ( and a company!). Different people have different ideas of what constitutes a video blog! My husband, DaVinci works hard creating his "little Movies" while traveling & being a great Dad & husband and I think he absolutely deserves the recognition for his very high quality, artistic videos! Obviously, I think we deserve Best Themed too and want that because it represents this blog. We are pretty ancient as websites go & I am pretty sure we are the oldest blog in the contest! We are certainly the longest blog in existence for our category of Best Themed with so much better page rank and alexa ratings which should count for something. Plus the only one who has managed to do it for so long while traveling as a family!! Carrie, I am really glad you explained your story because I know there was a lot of talk around the blogosphere when you won the Divine Caroline contest and no one had ever heard of you. Kimba, it is interesting that you and Matt have very different views of the Webby awards. I think that is part of the problem, nobody can quite agree what is fair. Gennaro and Craig- I really agree with supporting this fully and rejoice in what it will do for travel and all travel bloggers! Heather, you are right, let's just wait and see! Thanks Vanessa, we are truly thrilled and honored. I hope we win all 3, but if we don't we will always know we got 3 nominations which we never expected! Bless you to my other reader named Carrie ( that I linked to here who wrote the sweetest post about us), I so appreciate your vote! Thanks SammyK! Families can do extended & exotic travel too! Thanks everyone for the great conversation...now lets go vote and get everyone we know to vote!